Neurosurgeon performing surgery at Legacy Emanuel Medical Center Photo by: Vicki Guinn. 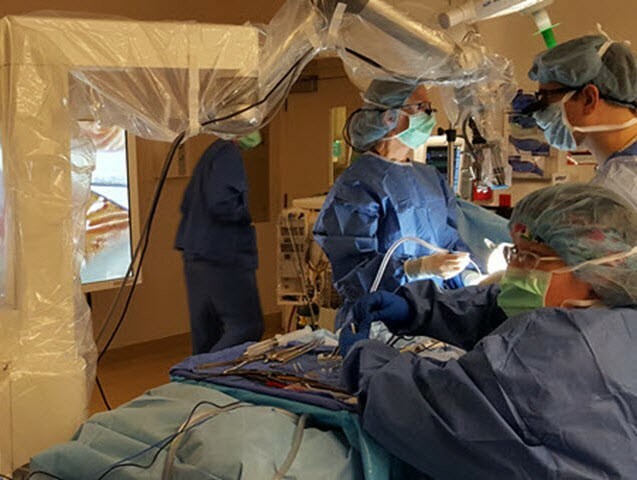 Legacy Emanuel Medical Center is the first hospital in Oregon to acquire an advanced robotic imaging and navigation system for more precise brain tumor removal and spinal surgeries. The Synaptive BrightMatter technology integrates pre-operative imaging, surgical planning and robotic visualization to give neurosurgeons the ability to see relevant details in the brain not visible to the human eye, which may allow for much safer surgical intervention. During the pre-operative phase, neurosurgeons use the system’s whole brain tractography technology to create images to plan a safer route to reach a tumor. Having this roadmap ahead of time helps the neurosurgeons consider approaches for navigating around critical structures within the brain to reduce the chance of damaging or interfering with important language, visual and movement pathways. Also, neurosurgeons may be able to reach tumors once deemed inoperable or higher risk. The technology’s robotic visualization system consists of a movable arm with a digital video camera system and a high-powered microscope attached that follows the neurosurgeons sensor-driven tools. The incision area is projected in real-time on a 55-inch monitor screen. The 3-D whole brain tractography image is there as well to guide the neurosurgeon’s instruments throughout the surgery. This hands-free optical visualization has an added benefit for neurosurgeons ergonomically ― typical surgical microscopes require more bending of the head and neck. Last year, Legacy Health performed almost 400 craniotomies (brain) and 1,600 spinal surgeries, with the majority at Legacy Emanuel.